and stamp next to heart to create this hand-some heart! sprinkle some salt over the painting. The heart will sparkle when it dries! red ink pad and let them decorate the hearts with their fingerprints or thumbprints. love bugs, and so on. Trace child's hands and feet. Cut out a big size heart and let the child make a face on it. and legs. Glue their hand and feet prints and you have a valentine person with their prints. two apart. Thread a drinking straw into one hole and back out the other. to lightly rub over hearts, making a pattern on paper. their lacy heart rubbings on folded sheets of red construction paper to make valentine cards. the heart shapes they want and glue them all over their papers to make texture collages. the child to use glitter glue pens to give the love bug a little extra sparkle. papers. Then let them cover their papers with the tissue paper hearts. As it dries, the hearts will fall off leaving red heart prints. help the tissue pieces stick to the hearts while making the red color translucent. Pour small amounts of red and pink tempera paint into separate shallow containers. Set out heart shaped cookie cutters and sponges cut in the shapes of hearts. into the paint and pressing them on sheets of white construction paper. brushes. Give each child a number of heart shapes cut from red tissue paper. arrange their tissue paper hearts on top of the starch to make collages. 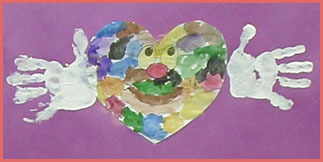 Precut the hearts and encourage the children to glue the hearts to create a Panda pal. For older children, encourage them to create a Panda without using patterns. Have the children cut three hearts the same size and fold them in half. hole punch to put a hole in the top and hang around the room. Mix white glue with dry red tempera. Cut a three inch square of oak tag paper. Cover the square with foil. Paint a valentine picture on the foil with glue. Frame or glue on a large red heart. children Valentine stickers to put on the heart. Make different sizes of hearts. the children to let their creativity run wild. Let each child glue strips of red, pink and white paper together to make a chain. print the names on the loops of his/her chain. palm prints are side by side and the thumbprints and fingerprints overlap. the child's name, and the date. the party we added the face, arms, and hands. The kids really got a kick out of these! (opposite the end with the nose and whiskers), and let it hang out. Add a greeting on the inside. at the top of the heart but let it hang off of the heart. Fold in half like a teardrop. of big heart so they form an ear on each side. Add whiskers, eyes, and a little pink nose. Fold a large piece of construction paper in half. Cut out a half-heart on the fold. at the tapered end. You can draw them in or add pom-poms and wiggly eyes. the end of the mouse's tail between two hearts. I use pink crinkle paper. or use them as a mailbox for valentines. heart onto a piece of paper. The children then use markers to draw faces, arms, and legs. combine them into loveable animals, and paste them on white sheets of paper. (the universal hand symbol for 'I love you') Fill with little candies. the heart on red construction paper. over the heart to mix colors. Open it up and you have a neat design! more slits to create six pie shaped sections. Fold sections up to make a crown. crown by gluing conversation hearts to each point. Now Crown your King or Queen. 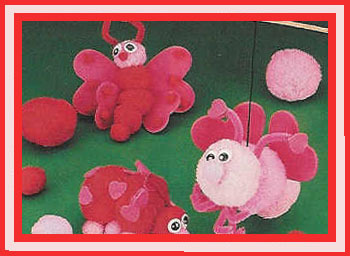 eyes, and pipe cleaners, encourage the children to create their very own luv bug. Valentine’s Day" can be written on it with a fine tip permanent marker. in the top of the whole paper plate and attach a piece of yarn for a hanger. and legs. The kids can be as creative as they wish with the decorating. branch set in sand or clay. Trim the tree with paper flowers, hearts, birds, and ribbons. Here's a sweet way for youngsters to send their valentine messages. one end of the strip into the top part of the candy kiss form. Stock your art area with silk roses and shallow pans of tempera paint. If desired, add a few drops of rose potpourri oil or perfume to the paint. large sheets of paper to create rose prints. Everything is coming up roses! For each child cut two identical placemat ovals out of clear self stick paper. sticky side down, over the child's decorated oval. pink paint. Close the lid and let the kids shake/tilt the box for a minute or so. When they open it up, they will have a heart with a "marbled" design on it. They look really cool and the kids love seeing what happened to the heart. outline of half a heart. Or the child could substitute the end of a large craft stick for his/her thumb. a construction paper background to create a design or picture. Have children cut out a heart from tagboard. Have them decorate it. 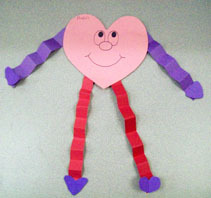 Attach a craft stick to each to create a valentine fan. onto one heart. Cover with another waxed paper heart. The teacher irons the hearts with a warm iron. behind heart shaped hole. Display hearts on windows for a stained glass look. Use a black magic marker to draw a heart outline on paper towels. Brush water onto the outline. Watch the colors bleed. and not too big, you can hot glue them to a cheap wreath and make a valentines wreath! Add a bow, some ribbon or raffia, and some valentines day pics to finish the look. heart stickers, and glitter. 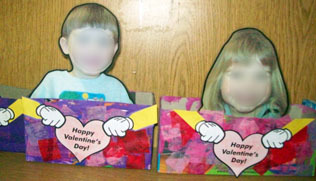 When the glue has dried, display the red valentine collages on a wall or a bulletin board. Using crayons or markers, children draw pictures of all the things they love to do. bulletin board or as a border to display work children have completed while working on the letter V.
Cut an extra large heart shape out of pink construction paper or butcher paper. of white butcher paper. Then hang the heart on the wall or bulletin board. Cut small heart shapes from red and pink construction paper, wrapping paper, foil, tissue boxes, etc. Use a hole punch to punch out "dots" from the same materials and cut paper lace into small pieces. loops of yarn to the backs of the decorated doilies and hang them around the room. fold a paper in half, draw half a heart, then cut the folded paper to get a heart the same shape on both sides. paper. Center it over the first sheet of Con-Tact paper and then place it on the paper adhesive side down. and then thread a length of yarn or ribbon through the holes to create a handle. paper hearts. A piece of paper rolled into a cone shape forms the queen's body. Make a tiny slit at the top to hold a heart-shaped head, with paper lace for the crown. Royal robes may be made of paper or cloth, trimmed in sequins, hearts, metallic foil, or paper lace. jar so that the top of the heart extends beyond the top of the jar (gives the appearance of ears). (looks like a cottontail). Have kids draw the face on the large heart before gluing. cut from different colors of construction paper to glue around their flower centers for petals. Then let them glue on larger heart shapes cut from green construction paper for leaves. shape red and press it onto white paper. Allow the children to make any pictures they wish. For each child cut a large heart shape out of white construction paper and fold it in half. fold their shapes closed and gently rub across them with their hands. Then have them open their heart shapes to reveal the designs they created. the frame. Then you lacquer them and let dry. Then slip a picture of the child into the frame. onto a construction paper heart to make a confetti collage. their bears. When the glue has dried, let the children add eyes and other details with felt tip markers. On the back of each child's bear, print "A Beary Happy Valentine's Day!" and help the child sign his or her name. crayons or felt tip markers, if desired. Display the children's creations on a wall or bulletin board. smaller pieces...they may not want you to do this to their work. Cut along the lines to make the puzzle. are for putting in the Valentines each child receives. Teachers can put treats in as well. Cut a heart shape and fold it in half. Open the fold and use valentine colors to string paint. up to see the beautiful designs. Attach strings to clothes pins for easier handling. Use a 3" heart on poster board as candle base. Center a small york mint patty onto heart. Stick on with double stick tape. Then, place a small piece of tape on one end of a lifesaver roll, attach to mint. Place tape on flat end of a hershey kiss or hug and attach to top of lifesaver roll. It should now look like a candle. Take two Hershey kisses, still in foil, place flat ends together. Take a 4 1/2" x 4 1/2" piece of cellophane. tightly around the wire and cellophane. While wrapping with tape add an artificial leaf up next to the bud. wire the better your stem looks, not too bumpy. · After a few tries you will get the hang of it. You may also choose to use other colors of cellophane, yellow, blue or purple. A mixture of all the colors makes a great bouquet. Copy one large heart onto red or pink construction paper, one medium heart, and two small hearts. (side by side from each other). Then cut four tiny slits around the holes to make larger openings. heart to one end of each paper strip; then glue the other end of each strip to the large heart. To give the puppets legs, poke your index and middle fingers through the holes in the large heart. To begin, gather several small, single-serving pie tins. Mold each tin into the shape of a heart. into small pieces. Have them sort the crayons by color, filling each tin almost to the rim. the special valentine crayons and cutouts to make heart rubbings on a sheet of paper. To make these cute place markers for your Valentine Party table, begin by making the base. Cut a two inch section from a paper towel tube. Then cut two parallel slits halfway down the tube. at the table and then challenge your youngsters to find their seats. the card and connects the dots to reveal the shape or letter. of heart shaped paper. Get one of those little glass votive holder to sit in the top with a pretty red candle. Tie a pretty ribbon around it and maybe paint Happy Valentines Day on the front of the glass. Because I love you and all that you do! verse in the middle. And have the children decorate them as they like ...if you wish. Or paint them prior to putting on the candy kisses. save landfill space and natural resources by recycling a discarded tissue box to make a valentine card container. hang (you may want to apply hole reinforcements also). cut out hearts in the stencil box for the children to use in the art center. outline the heart shape, so it is easier to see the shape. they fill each of them with their valentines.